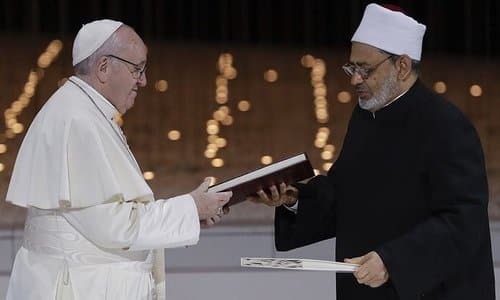 The document, signed by Pope Francis and the Grand Imam of al-Azhar, Ahmed el-Tayeb, was prepared "with much reflection and prayer", the Pope said. The one great danger at this moment, he continued, is "destruction, war, hatred between us." "If we believers are not able to shake hands, embrace one another, kiss one another, and even pray, our faith will be defeated", he said. The Pope explained that the document "is born of faith in God who is the Father of all and the Father of peace; it condemns all destruction, all terrorism, from the first terrorism in history, that of Cain."